To start off the discussion, the panelists all agreed that it’s apparent to marketers around the world that mobile is where the audience is. The target audiences that brands have been chasing since the inception of advertising have chosen mobile as the primary screen for entertainment. Users today are definitely mobile-first and their ‘down time’ usage is a great opportunity for brands to engage in a meaningful conversation with potential consumers. This is because they are in the best frame of mind to receive engaging content during their down time. And when it comes to marketers, mobile can easily become the unique, unifying component to enables them to go offline to online, on account of the rich data signals that mobile provides, especially on location and user behavior. 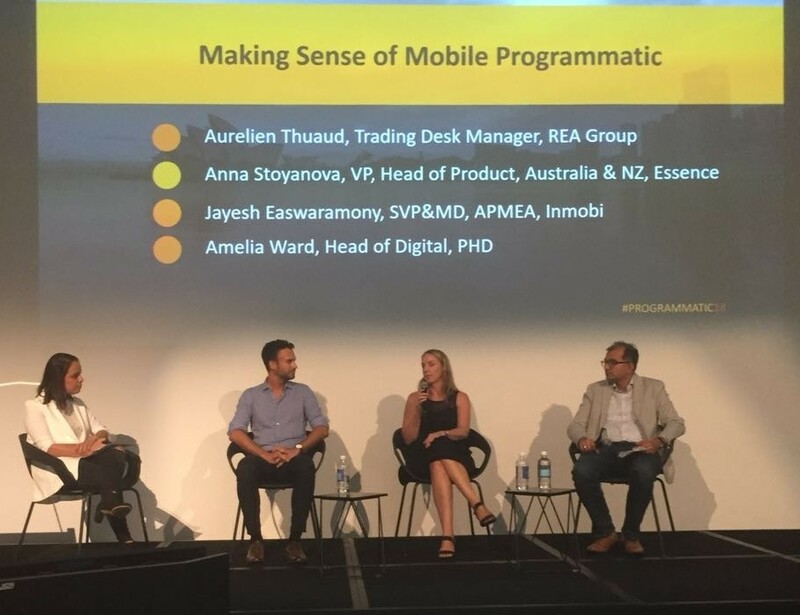 Despite the clear advantage, however, all panelists thought that marketers in Australia are not yet mobile-first; they lag behind in the time and media budgets allocated to both mobile and mobile programmatic, with the latter still considered to be in the too- hard basket. The mobile channel offers brands a unique opportunity to engage with every potential customer, one-on-one, in the most creative and innovative ways yet – through mobile-first formats that maximise the native features of the device, such as the front camera or gyroscope. Jayesh shared that a fantastic example of such a format was vertical video - a blockbuster ad format that doesn’t force users to tilt their screen. Couple these mobile-first formats with interactive elements and programmatic buy and what you get is an explosion of meaningful, efficient and high-ROI brand engagement. And when it comes to delivering dynamic, personalized creative at scale, mobile programmatic is the way to go. behaviours ensures that mobile is an indispensable part of the path to purchase. Importantly, the ability to find and reach highly granular audiences, lies largely with companies that have an extensive in-app SDK footprint, as well as great data partnerships. This allows brands to access rich audiences, formed by merging first, second and third-party data. So far, cookies have dominated the Australian advertising ecosystem and despite the sunk cost in cookie data, marketers still want to extract some value from their investment, ignoring the fact that the world has moved towards device-ID led attribution. Whether advertising in-app or on m-site, the best ways to track audience engagement and conversions is using the device ID. The panelists also shared that while attribution is a large, all-encompassing term, certain hygiene factors have emerged - brand safety, viewability and anti-fraud capabilities. Having touched upon the interactive elements of ads, brand vs direct response mobile campaigns, how to find audiences and measuring success on mobile, the panel ended with all participants sharing their excitement over the consumer-oriented campaigns and mobile-first innovation that they were sure the next 12 months would bring about, in Australia!